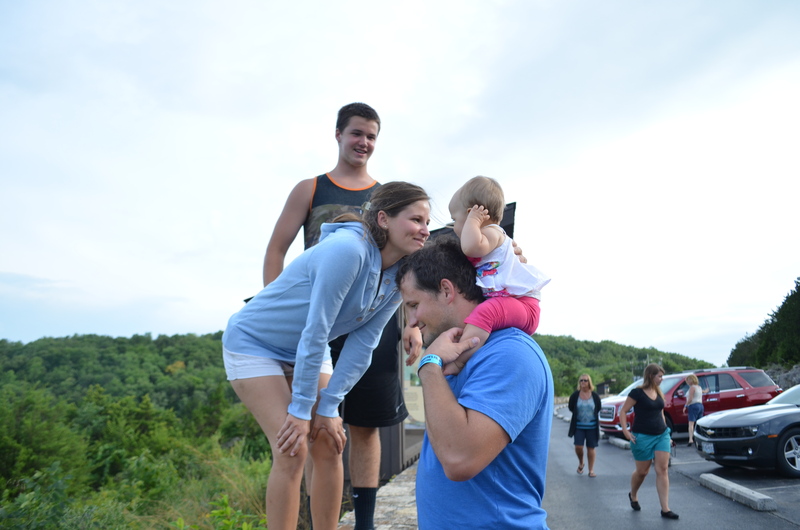 Every 2 years, Ryan’s family takes a vacation to Branson, Missouri. 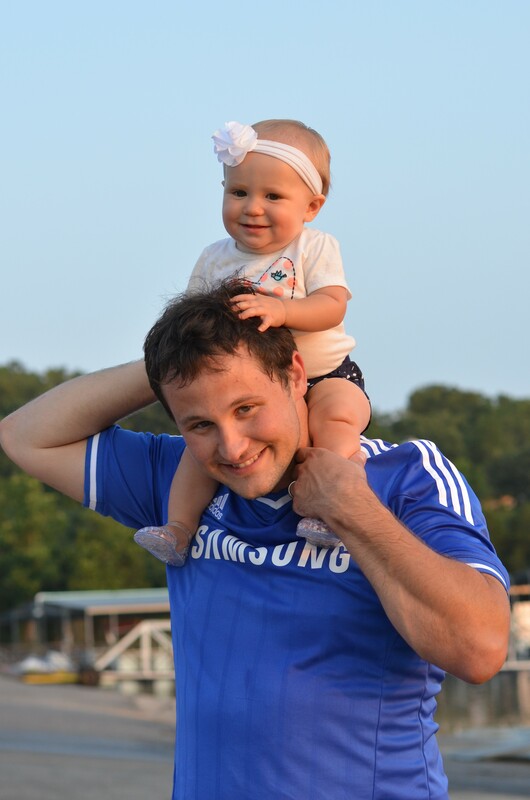 When Kinsie was less than a year old, we got to go, but we didn’t get to 2 years ago due to Ryan’s med school schedule. 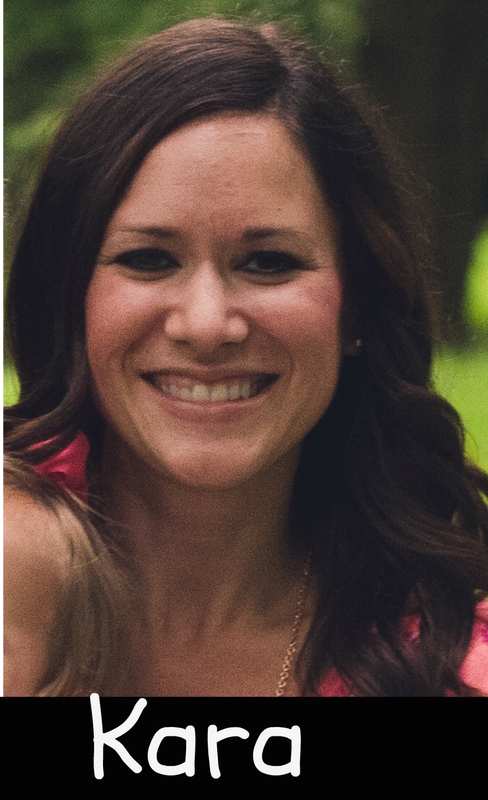 We were so excited that we were able to go again this year, especially since its only 3 hours away from Little Rock, and we knew the kids were at perfect ages to enjoy all the fun things to do there. 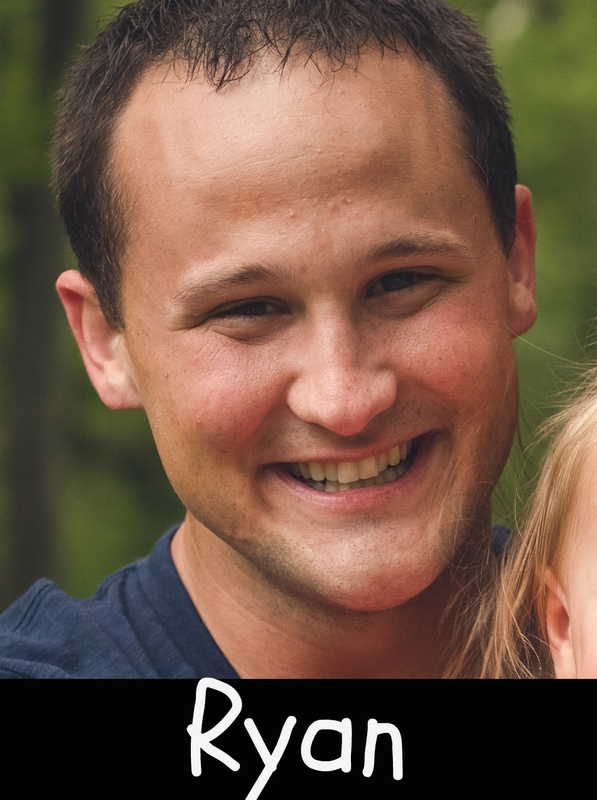 Ryan was able to use one of his weeks of vacation for the trip, which was much needed after last month. We had an awesome trip and had made some wonderful memories. This was one of our favorite things we did last time we came. There are 2 parts to this zoo, a walk-through and a drive-through. 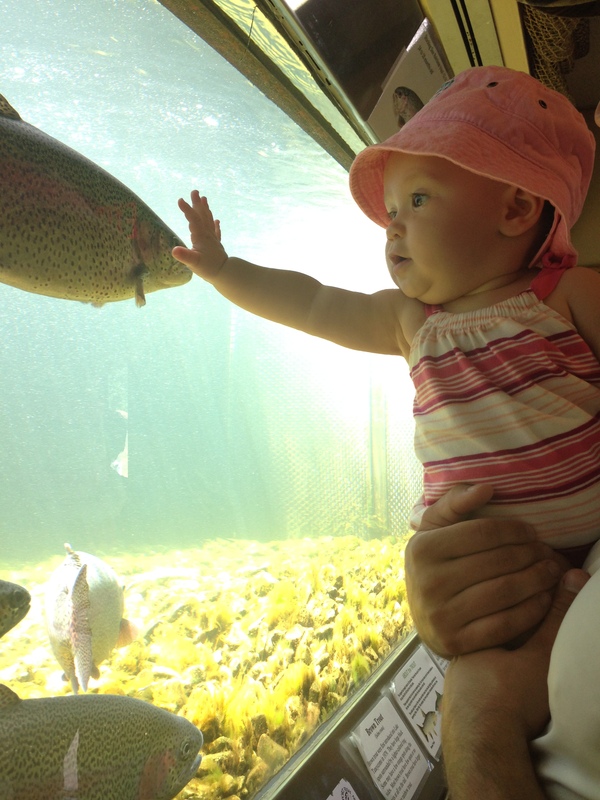 At both, you get up close and personal with lots of animals, and get to feed many of them. 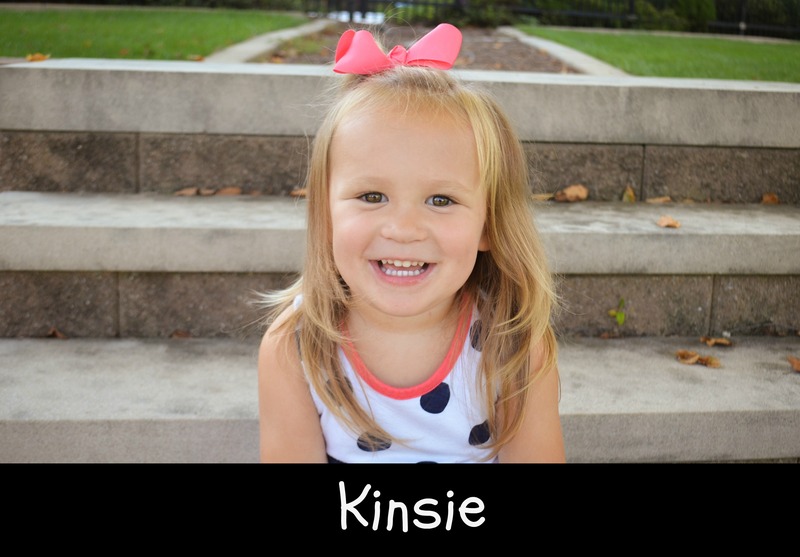 Even as a baby, Kinsie has always loved animals, and she loved feeding the animals at the zoo, and sticking her head out the window as we drive around while animals came up to our car windows. 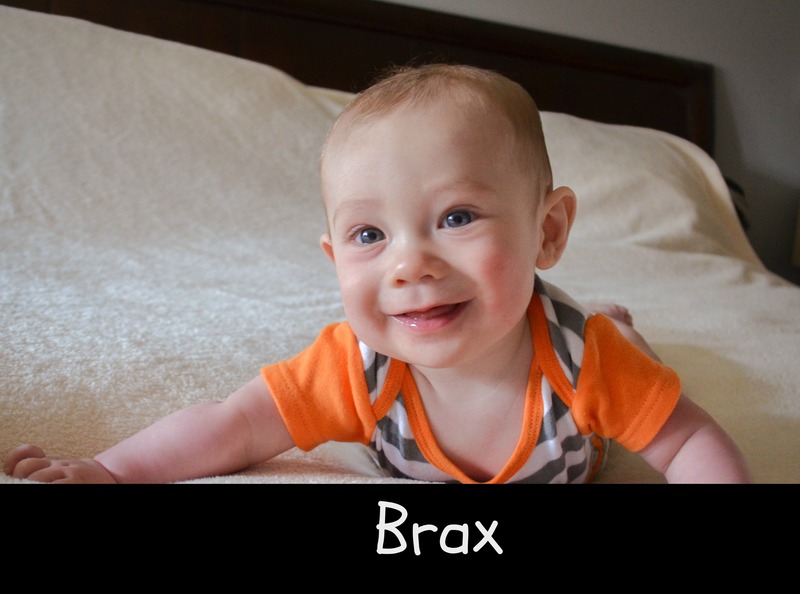 Brax has developed that same love for animals, so this time we had 2 very happy children! We planned the walk-through part right because we got there right when it opened, before it got too hot outside. 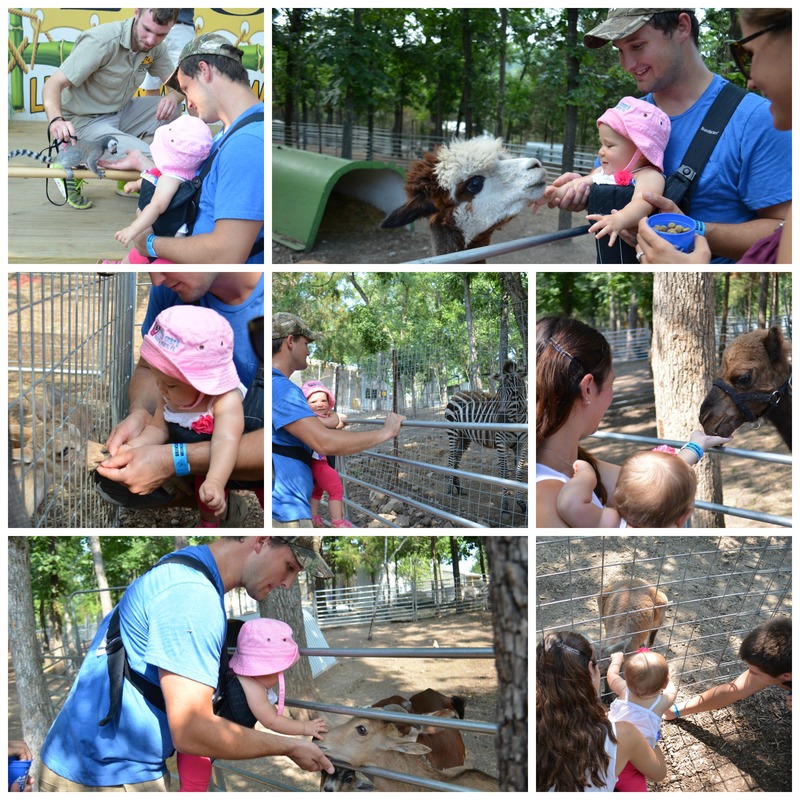 We loved walking around petting and feeding birds, kangaroos, camels and more. Then we had lunch, and drove to the drive-through zoo. At first the kids (and myself) weren’t so sure about emus coming right up to the car, but we eventually became friends and the kids loved it! Such a fun day! 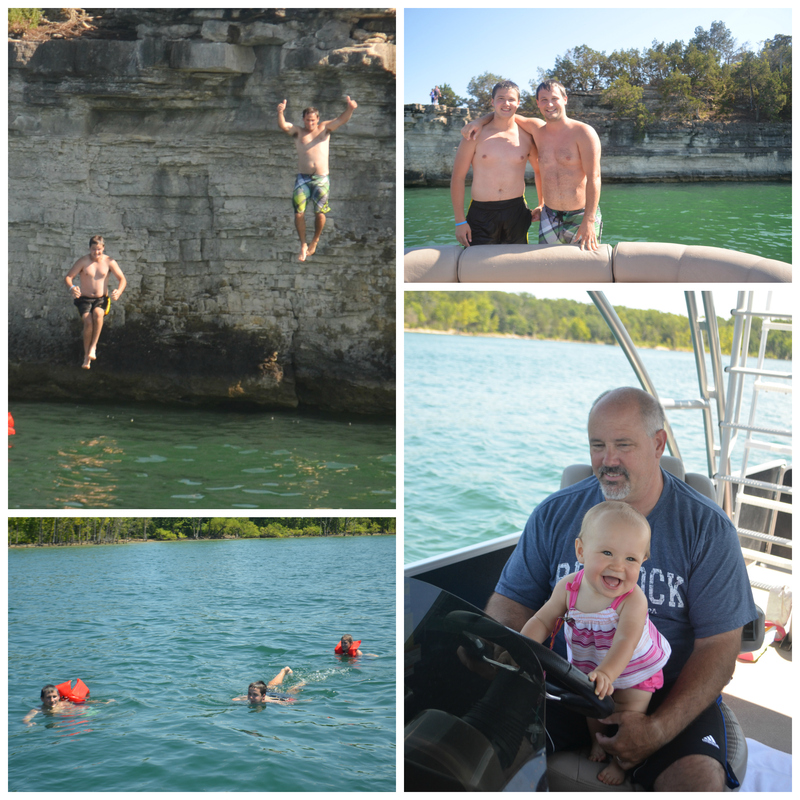 We rented a pontoon boat for 2 days at Table Rock Lake. We spent all day on the water, only stopping at small restaurants on the water with decks to eat lunch. Since it was so hot, we spent a considerable amount of time just lounging in the water. Kinsie has become much more comfortable in the water this summer, and she was a little fish swimming all over the lake. Brax loved it too, and even took a nap on the boat (this is almost unheard of for him!) We love spending days on the lake! The village that Ryan’s parents have their time share is perfect for kids. They have an awesome pool area with an amazing kids section. As soon as we got to the village on the first day, the kids were dying to play in the pool area. Again, with the heat, we didn’t mind a few pool days. The kids had a BLAST. The entire kids area is extremely shallow, so it was perfect for them to run around in! 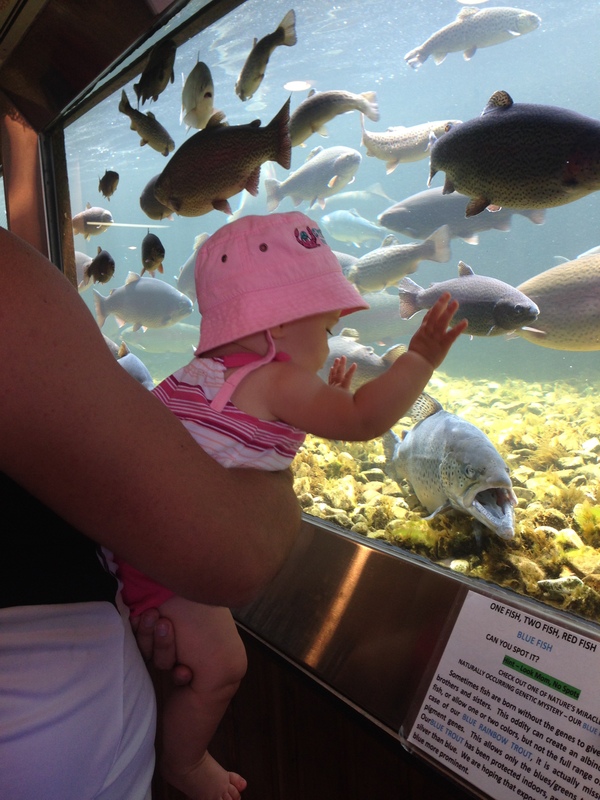 There is a new aquarium in Springfield, MO, which was about an hour away from Branson. We needed at least a day doing something indoors, and this was the perfect option. It was amazing! The building had an aquarium section, and a museum section, and we only did the aquarium side and just that took us over 3 hours to see everything. Some of the highlights were feeding the stingrays, and drawing a sea creature and scanning it to see it come to life on a large projector screen…so cool! The kids and I rode back to Indiana with Ryan’s family to stay for a week after Branson (Ryan had to work, so he drove back to Little Rock). St. Louis is about halfway between Branson and Indianapolis, and they have a great (free) zoo (with hippos)! We stopped for a couple hours just to see some of the kids’ favorites. It was EXTREMELY humid, almost so much that it was hard to enjoy, but Kinsie doesn’t get to see hippos everyday, so we persisted! They loved the animals we got to see, including hippos, gorillas, elephants, penguins, and bears. It was definitely worth the stop! We had such a great week, and it was so nice having Ryan for a week. The kids LOVE whenever he has time off, and they are always ALL about him! 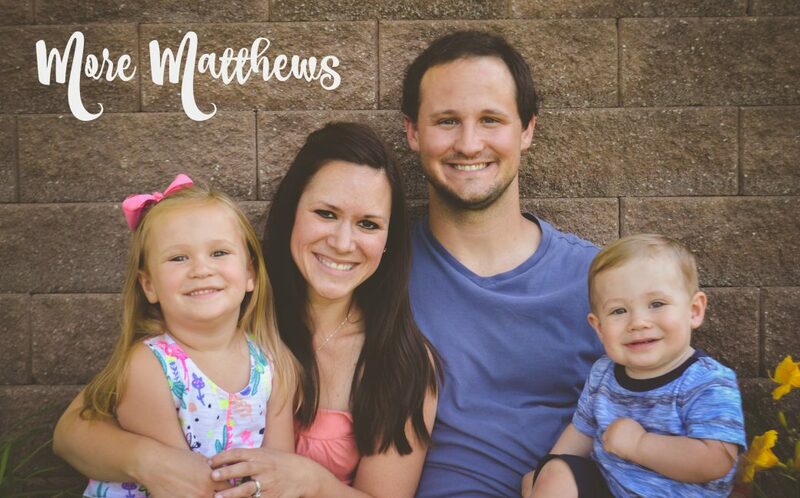 We are so grateful to his family to letting us be a part of such a great trip! Well, to say that the past couple of weeks have been busy would be a huge understatement. 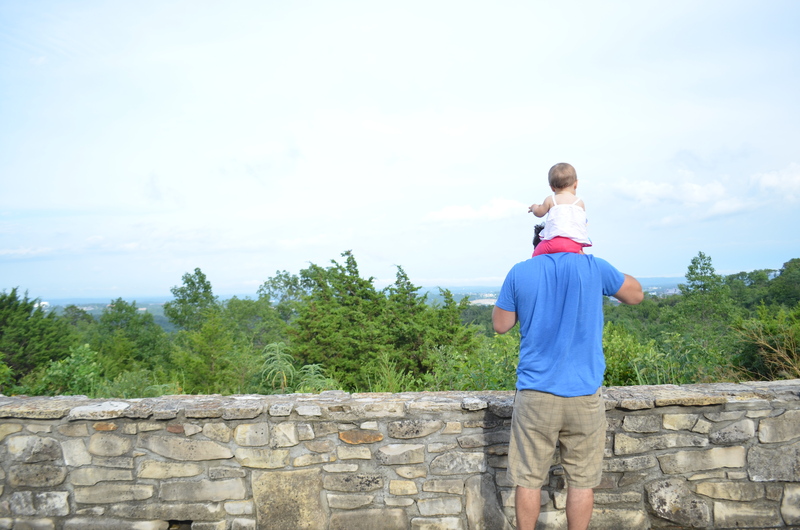 I will go into more detail on our busy few weeks later, but for now, I want to share an awesome vacation we took at the end of July to Branson with Ryan’s family! 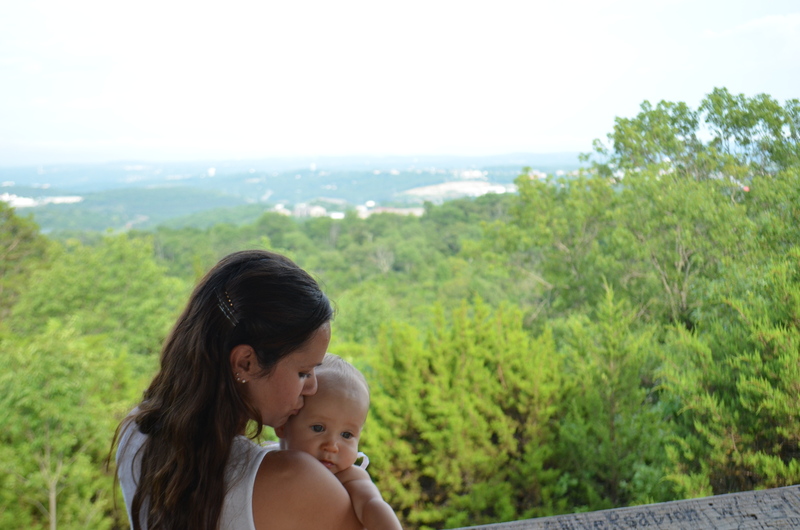 I may be like many of you who, when you think of Branson, Missouri, you automatically think of the movie “She’s Out of My League.” But don’t worry, we didn’t all get matching yellow sweatshirts that say “Branson Bound!” It was a great trip though, and of course, our sweet Kinsie had a blast! 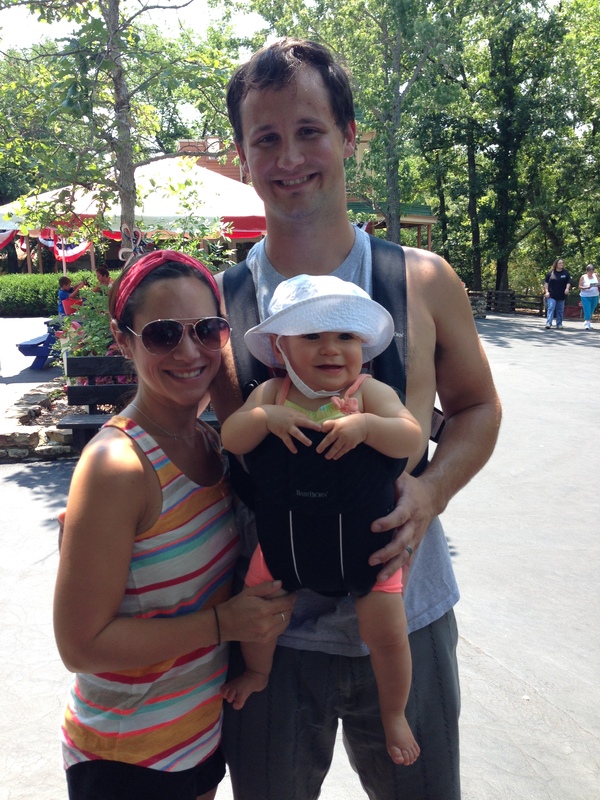 The next day, we went to the Silver Dollar City Amusement Park. It was a pretty cool park with rides, games, and shops. However, it definitely would have helped to have more indoor areas since it was 90 degrees outside! I spent most of my day trying to keep my little girl cool. Like usual, she still had fun! 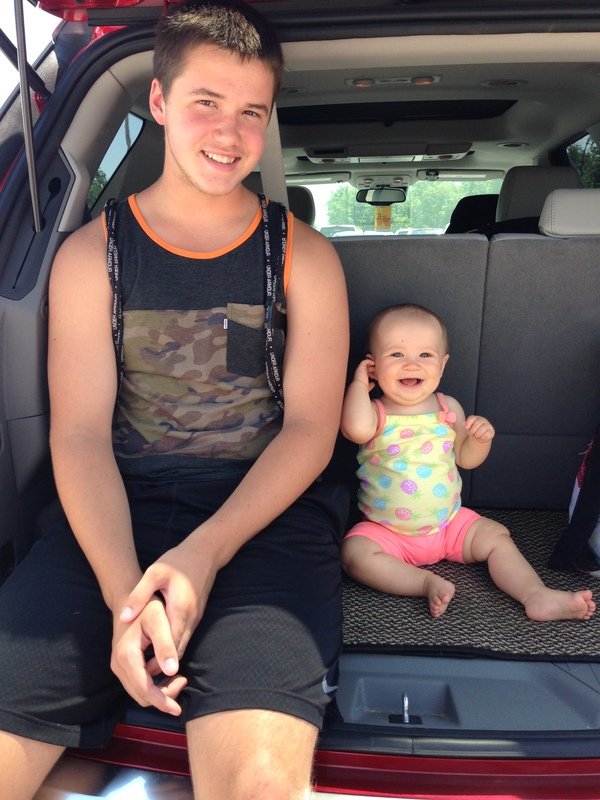 She loved spending the day in the Baby Bjorn with her daddy. We really wanted her to get to go on a ride, but there were limited options for her age. 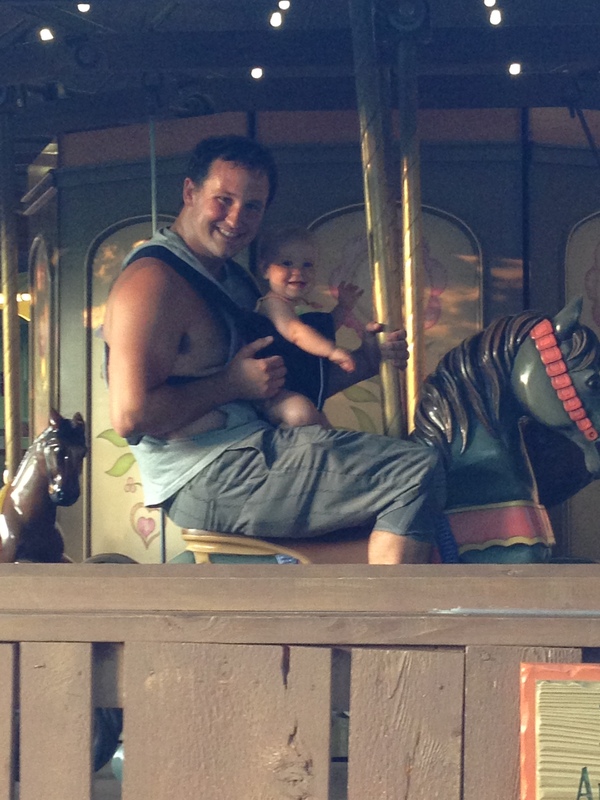 She ended up getting to ride the carousel for the first time and loved it! The only thing she didn’t like about the park was the train ride. Mainly because we were right in the front and the train had a very loud whistle. Every time the whistle was blown, she started crying. It broke my heart! Next time we ride a train, we’ll be sure to sit farther back where it isn’t as loud and maybe she’ll enjoy it a little more! 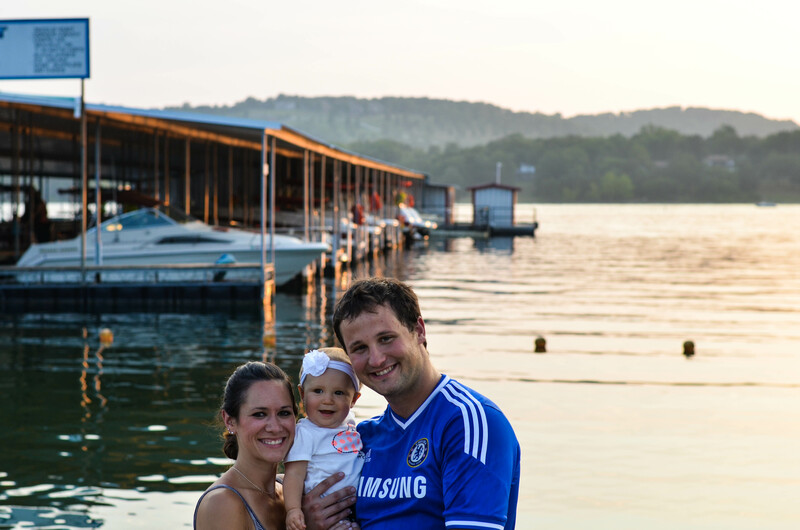 One night after dinner, we went to a dock on Table Rock Lake. There were tons of fish and geese on the lake and we bought fish food to feed them. Kinsie loved sitting on the dock and feeding the fish! 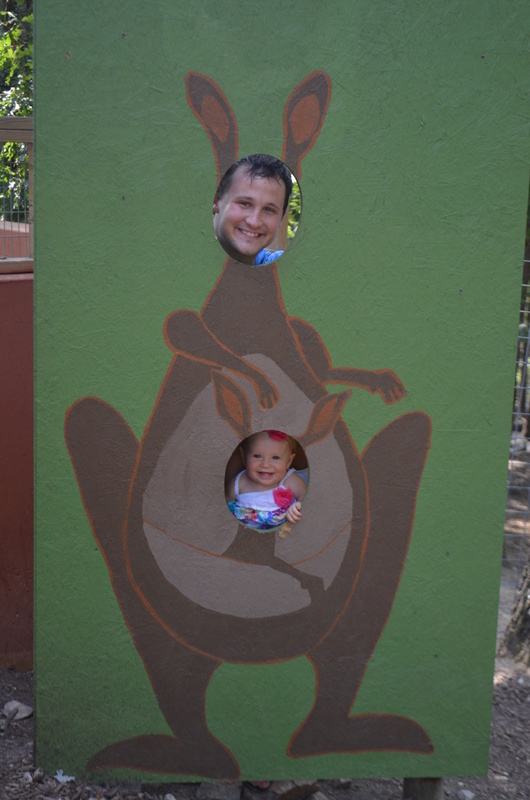 Kinsie’s favorite part of the trip was definitely the Promised Land Zoo. 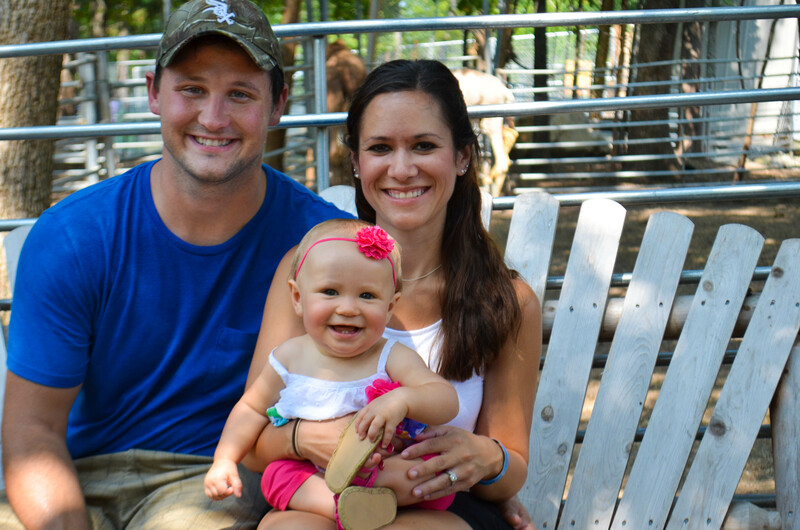 It is a family-owned zoo that had two parts, a walk-through part and a drive-through part. At this zoo, you could pet and feed most of the animals. It was awesome! 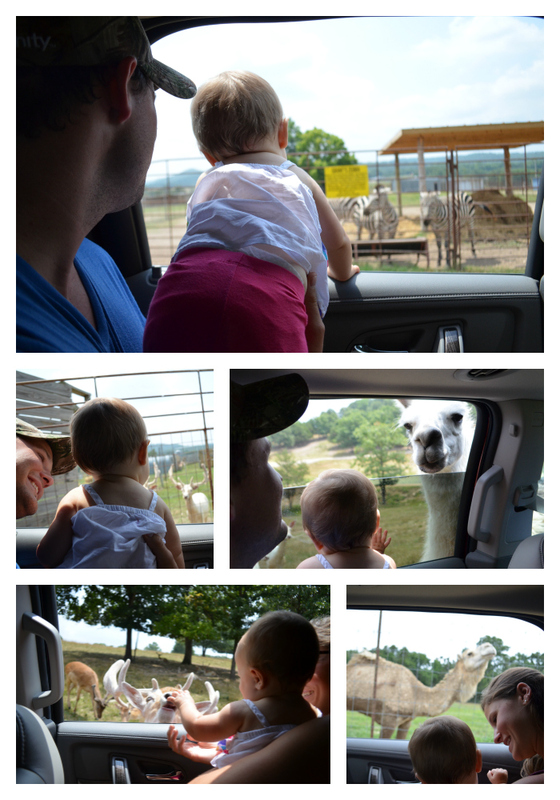 Kinsie absolutely loved all of the animals. She was not afraid in the least bit like I’m sure many kids her age would probably be. When we went through the driving part, we drove slow enough that we could just hold her on our laps so she could see everything. 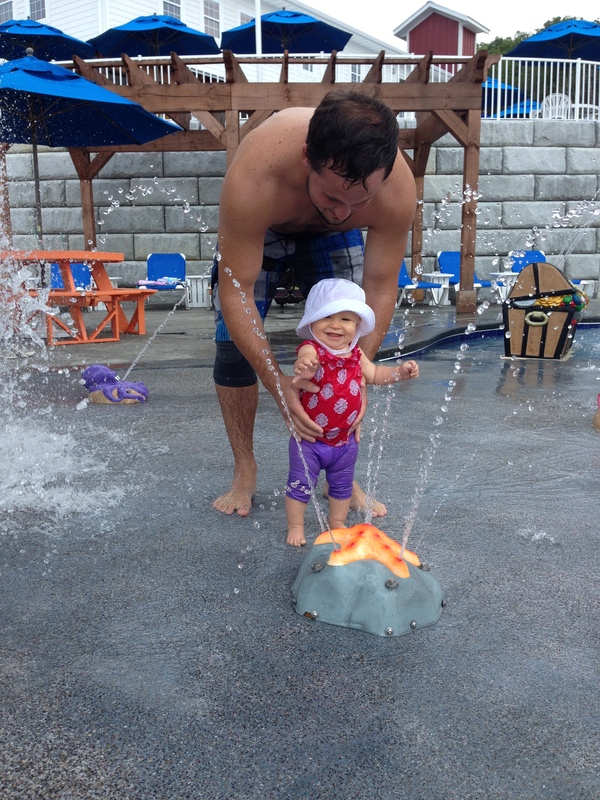 She thought it was the coolest thing…which, it kinda was! The animals would just walk up to the windows in the car so you could feed them. It was an amazing experience! We’ve been joking now that when Kinsie gets a little older, she is going to want us to buy a zoo! On our last day, we rented a pontoon boat. It had an upper level and a slide. 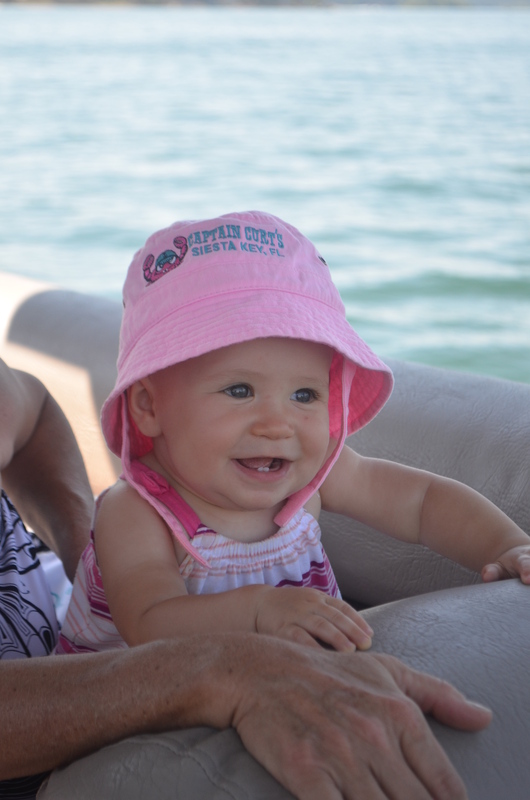 This wasn’t Kinsie’s first time on a boat, but she loved it all the same. She played, ate and even took a nap on the boat. What a life! On the way back home, we stopped at the St. Louis zoo. We figured it would be a nice break from the long car ride. We weren’t able to stay very long because it started storming, but for the time that we were there, we had a lot of fun. 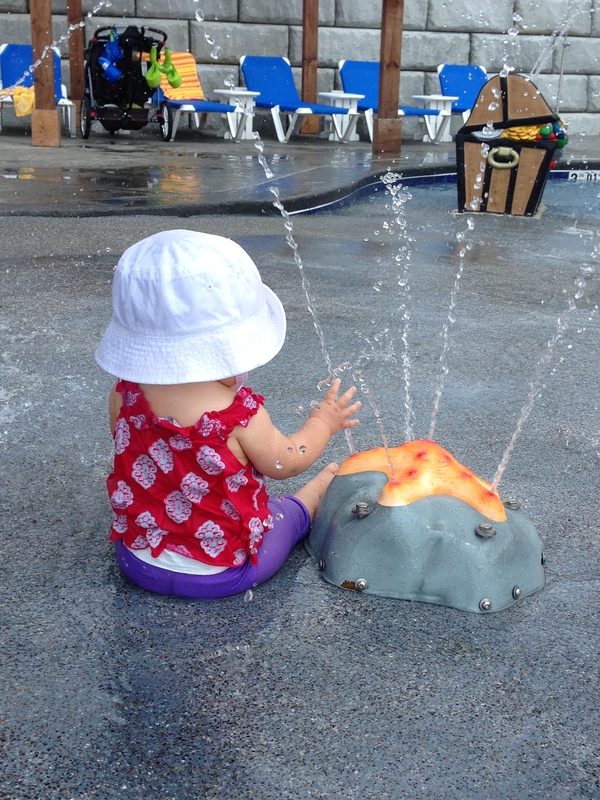 It was a little chilly and rainy, but that of course didn’t bother our little outdoor girl. We just wrapped her in a blanket and went on our way! 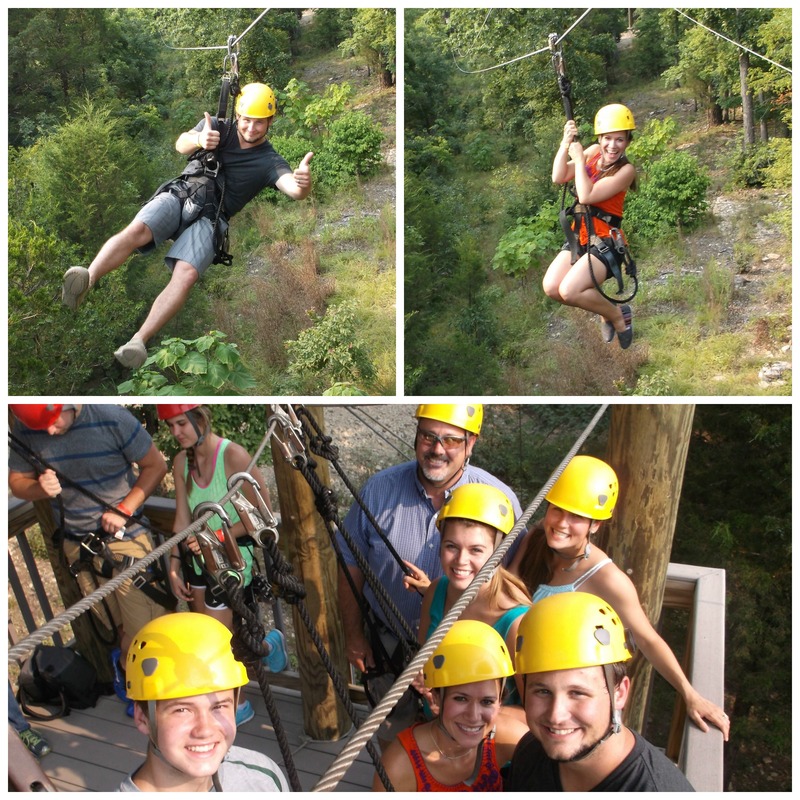 We did a lot of other cool things while in Branson, including zip lining (which is awesome by the way…I highly recommend doing it sometime! ), we went to see a show where two guys played music using buckets and other random objects, went to the fish hatchery, ate dinner at a great little Cajun restaurant (I am a Duck Dynasty wannabe), and lots more. It was so nice spending the week with Ryan’s family. This was the first time in at least 3 years that we were all able to go on vacation together. I know they all enjoyed it too, especially because they got to spend quality time with Miss Kinsie Kay. 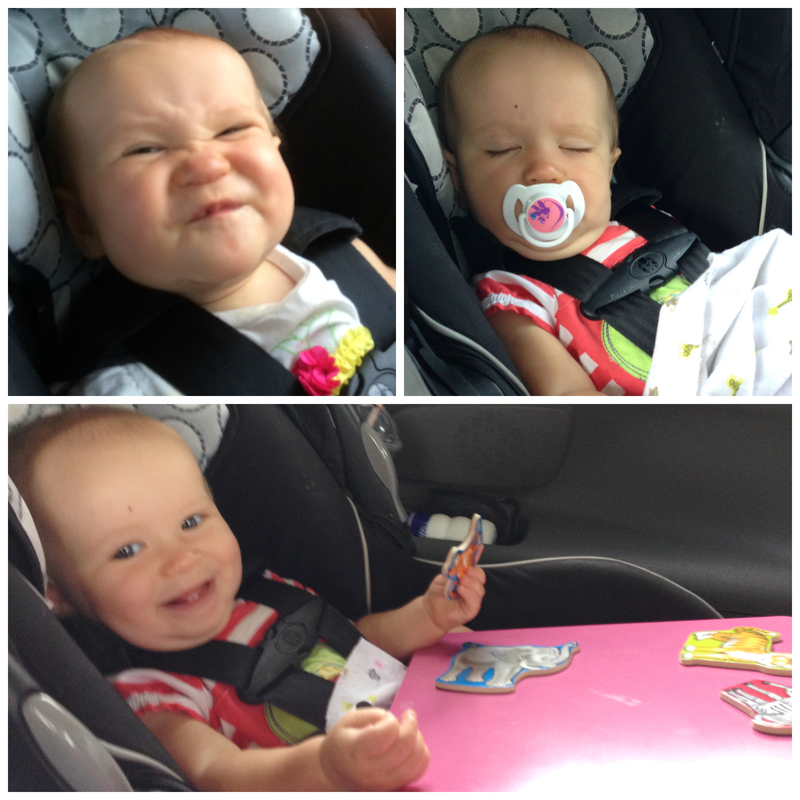 I mean, let’s be honest, she’s a pretty fun little chick to hang with!